I'll never understand why they just don't call them 'sternsprits', as in the opposite of 'bowsprit', but they don't. They call them boomkins or bumpkins or bumkins, which sounds a bit silly to me, but I don't get to make up these words. I've never liked the bumpkin that came with my boat. The plans call for a rather slender, probably varnished spar made from hickory. Since the bumpkin is not supported from above by a stay, it needs to be a strong cantilever if you want to be able to climb out on it to put on the mizzen sail cover, for instance. The BM's builder built them out of laminated douglas fir, instead, making up for DF's reduced strength by keeping the bumpkin 2 1/2" in diameter for it's whole length. The result was functional, but not particularly attractive, at least to my eyes. Even worse, the bumpkin curves in so sharply that it passes over the back of the outboard, so it is impossible to raise the outboard out of the water. This problem was made worse when I replaced the bracket in the photo above with a heavy duty bracket big enough to support my lovely Yamaha 9.9. It was so bad, in fact, that I couldn't even get the cover off to check the oil. Since I was doing more motoring than sailing on the ICW, this was a major pain. I liked to check the oil every few days, and I changed the oil every 500 miles or so. So I eventually removed the bumpkin. 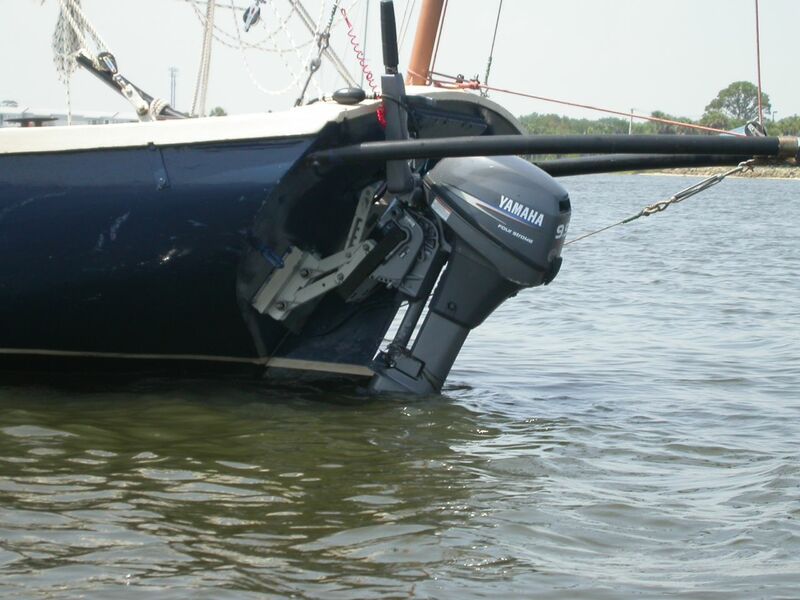 Last summer, I never did reinstall the bumpkin, since I needed to raise the motor when moored, and because I did a lot more sailing, and lifting the outboard out of the water adds at least 1/2 knot while sailing. To meet the first requirement, the bumpkin needs to curve around the space needed for the raised outboard. The current boomkin curves sharply in. I want the new one to curve out, and then in. 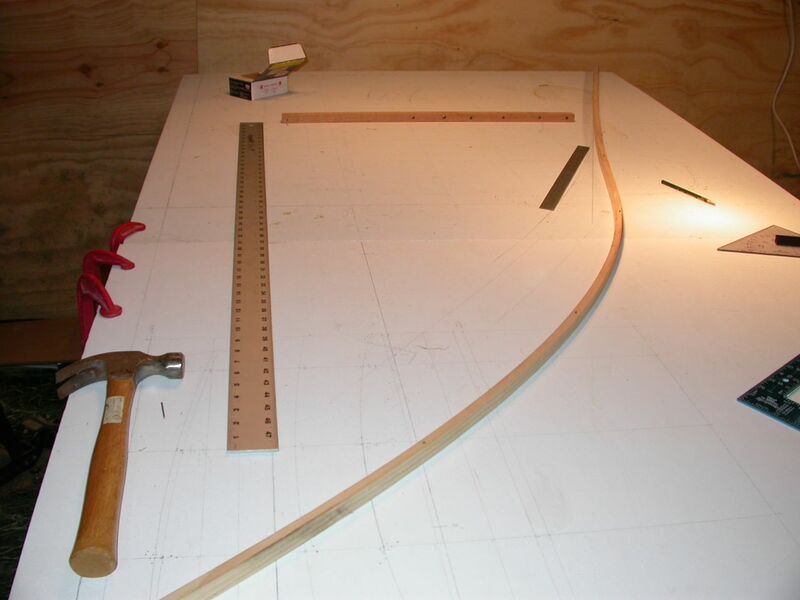 To achieve this, I first laid out the desired shape using a batten. The vertical 4' steel ruler shows the centerline of the boat. The horizontal piece of oak shows the transom line. The short steel ruler indicates the line of the current boomkin. 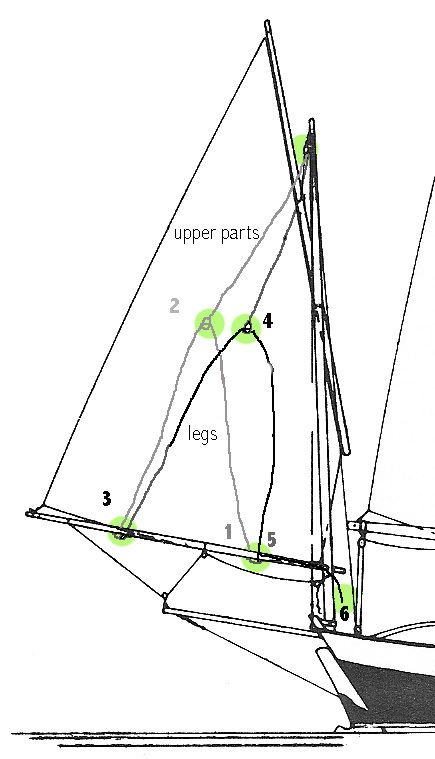 The batten shows the proposed shape of the new boomkin, which provides over 4" of extra space around the outboard, which should make it possible to raise it out of the water, without removing the boomkin. 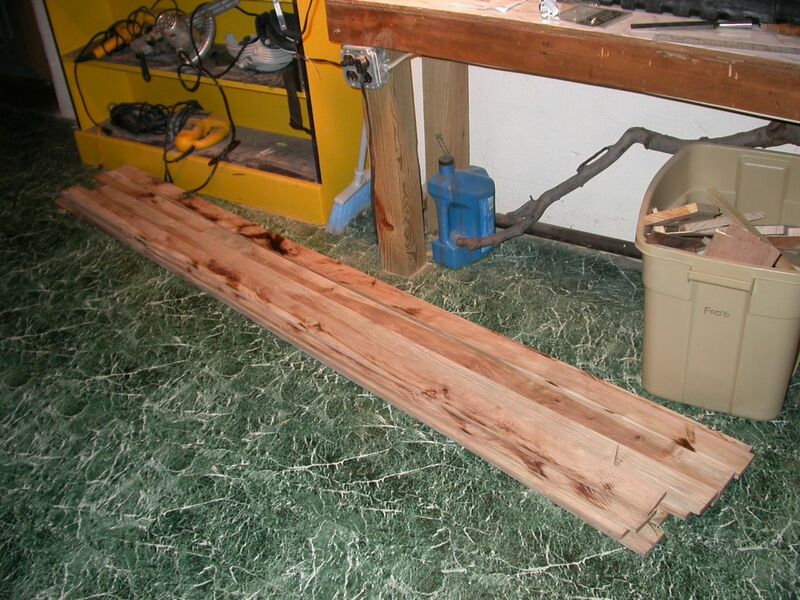 For wood, I am going to try to use hickory, as specified by Tom Gilmer. Last weekend, I bought two live-edge, air dried planks, about 2" thick from a local 'sawmill'... actually, a landscaper with a small portable sawmill. My boat building friend Roger was kind enough to help me mill them up into 2 1/2" boards, about 1/2" thick. Milled Hickory Boards ready for laminating. Unfortunately, the wood isn't of the highest quality. A couple of the boards have large knots that will probably make them unusable for this project, but I should have enough wood even without them. However, I am not sure these particular boards will bend into shape without cracking. Rather than spending a lot of time theorizing over this question, I'm just going to build a steam box and give it a try. If they crack, they crack. I didn't pay much for them, so no great loss. I'll then have to decide whether to try a better grade of hickory, or perhaps some other wood, like white oak. But that's getting ahead of myself. Over the next week or so, I'm going to build a bending form on the table above, and build a nice steam box, which I've been wanting to build, anyway. It should be rather interesting. I'll probably be posting fairly frequently, and don't want to send out too many emails to my subscribers, so just check back every 2-3 days if you are interested in following this project. I'll send out one more email when the project is done, if you want to wait until then to catch up. 'Sternsprit' might do, but 'quartersprit' would be better. But a 'bumpkin' is something else altogether: more agricultural than nautical. John, if steambending hickory proves problematic, you could always laminate it using epoxy. I'm sure you've thought of that. Actually, I might try laminating (without steaming) first. I'd have to resaw the hickory into thinner strips, first, which would be a bit of a pain on my bandsaw, but probably less of a pain than steaming. Interesting food you have there (third photo)! I have some like that, if you're hungry . . . Seriously, I hope the wood bends for you. Good luck. "Bumpkin" as in "Country Bumpkin" - a not very bright (aka THICK) fellow. Seems a bit appropriate for this particular spar. The 'country bumpkin' meaning comes from a different root word. The spar meaning dates back to the Dutch 'boomken' first cited in the 1600s. Two words with the same spelling (in English) but totally unrelated roots and meanings.